For the album, see The Albemarle Sound. Albemarle Sound with the northern Outer Banks. Orbital photo courtesy of NASA. Albemarle Sound ( /ˈælbəˌmɑːrl/) is a large estuary on the coast of North Carolina in the United States located at the confluence of a group of rivers, including the Chowan and Roanoke. It is separated from the Atlantic Ocean by the Currituck Banks, a barrier peninsula upon which the town of Kitty Hawk is located, at the eastern edge of the sound, and part of the greater Outer Banks region. Roanoke Island is situated at the southeastern corner of the sound, where it connects to Pamlico Sound. Much of the water in the Albemarle Sound is brackish or fresh, as opposed to the saltwater of the ocean, as a result of river water pouring into the sound. 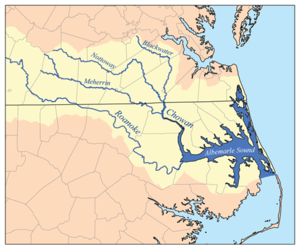 Some small portions of the Albemarle have been given their own "sound" names to distinguish these bodies of water from other parts of the large estuary. The Croatan Sound, for instance, lies between mainland Dare County and Roanoke Island. The eastern shore of the island to the Outer Banks is commonly referred to as the Roanoke Sound (which is also a historical name for the entire body of water now known as Albemarle Sound  ). The long stretch of water from near the Virginia state line south to around the Currituck County southern boundary is known as the Currituck Sound. The sound forms part of the Atlantic Intracoastal Waterway. Its coast saw the first permanent settlements in what became North Carolina, the English Albemarle Settlements. Many inland Tidewater communities along the Albemarle today are part of the Inner Banks region of the state. Norfolk Southern Railroad passenger train crosses the Albemarle Sound trestle in 1918. The trestle was demolished in the late 1980s. Before Europeans came to the Albemarle Sound, the Algonquian Indians lived in the region. They traveled the sound in dugout canoes, and trapped fish. In 1586 the first European explorers sailed up the fifty-five-mile (89 km) length of the Albemarle Sound. Half a century later, the first European settlers came south from Virginia, establishing agricultural and trading colonies along the shores of the Sound. The Albemarle Sound soon became a very important thoroughfare, with small trading ships called coasters carrying cargo to and from other colonies, and larger merchant ships bringing spices, silks, and sugars from the West Indies in exchange for products such as tobacco (a major export of the southern colonies), herring, and lumber. Ferries were a common method of transportation through the swamps surrounding the Albemarle Sound throughout the history of the region. One ferry that linked the towns of Edenton and Mackeys, North Carolina, continued in service from 1734 to 1938, when a bridge was built across the Sound. Another longer bridge of more than 3 miles (4.8 km) in length was built in 1990. Fishing was a major industry in the Albemarle Sound. In late spring, plantation farmers would fish for shad, striped bass, and herring. Nets used by these fishermen were sometimes enormous, with some more than a mile (1600 m) long, and were frequently staffed 24 hours a day. Herring was cut and salted for export to Europe, while shad was packed in ice and shipped up the Chowan River to be sold in northern colonies. Regional striped bass tournaments attracted sports fishermen to the area, and it was considered by many to be the greatest striped bass fishery in the world. Pollution and development in recent years have depleted the fisheries of the Albemarle Sound by seventy percent. ^ "Albemarle Sound". Encyclopædia Britannica. Retrieved 29 July 2015. ^ Mcpherson, Elizabeth G.; Paschal, Herbert R. "Batts, Nathaniell". NCpedia. Retrieved 29 July 2015. ^ "Museum of the Albermarle". Archived from the original on 29 April 2011. Retrieved 2011-04-19. "The Albemarle Sound". Archived from the original on February 12, 2008.